Search for all "Deoxyguanosine kinase"
Rabbit anti Bovine, Canine, Equine, Guinea Pig, Human, Porcine, Rabbit, Rat Deoxyguanosine kinase. 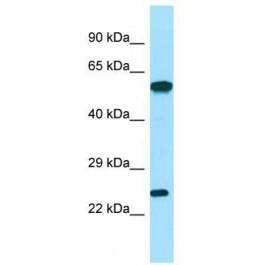 The immunogen for anti-DGUOK antibody is: synthetic peptide directed towards the C-terminal region of Human DGUOK. Synthetic peptide located within the following region: EQLHGQHEAWLIHKTTKLHFEALMNIPVLVLDVNDDFSEEVTKQEDLMRE. In mammalian cells, the phosphorylation of purine deoxyribonucleosides is mediated predomintly by two deoxyribonucleoside kises, cytosolic deoxycytidine kise and mitochondrial deoxyguanosine kise. The protein encoded by this gene is responsible for phosphorylation of purine deoxyribonucleosides in the mitochondrial matrix. In addition, this protein phosphorylates several purine deoxyribonucleoside alogs used in the treatment of lymphoproliferative disorders, and this phosphorylation is critical for the effectiveness of the alogs. Altertive splice variants encoding different protein isoforms have been described for this gene.